Follow the tips below and you can read all the magazines you want for little to no money out of your pocket! The tips are listed in order of most expensive to least expensive so if you really want to save money be sure to read them all. Once you subscribe to a magazine you’ll begin getting vague letters on how your subscription is ending and telling you to send in payment now for two years to guarantee continuous coverage. I was so annoyed by the attempts of Hearst Corporation to trick me into paying for subscriptions frequently and pre-maturely that I tried a little experiment. I threw away every letter I received from Hearst Corporation and it took me 8 months from the first letter until I stopped getting Smart Money magazine. Ignore their sneaky letters trying to get you to renew your subscription way before it’s due. Throw away their bills and you’ll know once your subscription ends because they’ll stop sending the magazine. Then you can pay the bill and the magazine will start showing up again. Why pay what the publisher charges when you can spend almost half as much by buying the exact same magazine on eBay? Keep an eye on the magazine listings on eBay and you’re guaranteed to find a good deal. Make sure the one you buy doesn’t charge you any shipping fees. This approach will still cost your friends or family money but you won’t pay a dime. I ask my parents for Smart Money or Kiplinger Personal Finance magazine subscriptions every year as a birthday or Christmas gift. This is a win-win; it is an easy gift for them to give and doesn’t cost you a thing. The magazine rack at work is always full of recent editions of Business Week, U.S. News & World Report, Business 2.0, Fortune, Computerworld, and many more magazines. Companies send subscriptions to the decision makers in our company but they’re often to busy to read them so the magazines go in the free rack. Sweet deal for the rest of us! If you’re looking for something less newsy this approach can work as well. My wife has several co-workers that read US and People magazine then bring them into work to pass around to others. This one is pretty obvious. I find it works best for magazines that are a month or two old because my library lets people take them home without even checking them out. You bring them back whenever you’re finished; of course the negative is you can’t tear out interesting articles for future reference. In this Information Age, there is so much free information available online. Many magazines make their articles available on the web after they’re published in print. The great feature here is that you can search on keywords to find articles that you’re interested in, a feature the printed version obviously doesn’t have. Being able to bookmark the article for future reference is also nicer than filing away a few ripped out magazine pages. Every time I recycle I’m amazed at the number and variety of magazines piled up in the recycling bin. This is probably the least preferred approach but it will work none the less. Of course you have to sort through the magazines but there are many for the taking. I haven’t tried this one because the previous tips meet my needs but if the earlier ideas don’t apply to you, try this one out. As a side note, if you recycle your magazines, be sure to cut out your address from cover so others can’t get your information. There you have it. Now there’s no excuse for you to ever pay more than zero to a few bucks for a magazine ever again! Do you buy magazines? What are some more ways you can save money? I have almost always been able to find better magazine prices online that from the publisher. Use caution with E bay or smaller on line sellers. It often takes 6-8 weeks to process a magazine order, and by the time you realize that you are not receiving, your charge back credit card rights have often expired. I have had 2 sellers finally admit that they could not fulfill the magazine offer made. One gave me a refund and the other did not, and it have been too long since the charge, there was nothing could do about it. Now, I will purchase from large reputable sellers like Amazon. I signed up for Canadian Business when they were offering a 1 year subscription and a free watch for 14.99. I needed a free watch because my band broke. It’s been a pretty decent read! I use http://www.magazinepricesearch.com. It always gets me the best deals. bestdealmagazines.com is your friend. I have not paid more than $6 for a magazine subscription in several years. Love love love that place! How about sign up and swap with a friend….. I personally watch for the deal sites and get them for free or less than $3. I just renewed one tonight for $3 actually! Magazines ? When we have all we want on the internet …so many quality websites and blogs … huhh. Thanks for the additional tips Billy and ispf, I’ll have to check out FatWallet and SlickDeals! Watch the free stuff forums over at Fatwallet and Slickdeals.net for free subscriptions. I get so many magazines for free that I don’t have time to read them all. Ebay is definitely the way to go! I have an annual subscription of the TIME magazine for $9.99 (all inclusive price)! I had no clue you could get annual magazine subscriptions on ebay, until a friend suggested it! Also, since I did not use credit card to pay, there is no risk of automatic renewal @ exorbitant rates when my subscription runs out! Another way I have got cheap magazine subscription in the past was by filling out a survey after an online purchase. The company that sent out the survey was bizrate.com and the magazine subscription was free for filling out the survey, but they charged me an administrative fee of $2.99. I’m not really one for magazines all over the place. I get all I really want off the internet, but if there is something in particular of interest, it’s good to know how to get it. 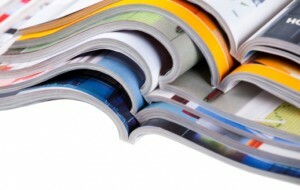 Random Goodness Tuesday - How to Save Money on Your Snazzy Magazines « Believement-Achievement! Mapgirl’s Fiscal Challenge / 68th Festival of Frugality!